Medium to high yielding variety of attractive appearance. 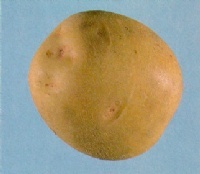 Large tubers are slightly susceptible to hollow heart. Excellent storability; long dormancy period. High specific gravity. Bred from the cross (Norgleam x W5279-4) at the University of Guelph and selected jointly by Agriculture Canada, the University of Guelph and the Ontario Ministry of Agriculture and Food, Guelph, Ontario (Canada) in 1966.
open, moderately shiny, olive green, stiffly pubescent; nodes not swollen. Terminal leaflets: obovate, gradually tapered to the base; tip slightly acuminate. Primary leaflets: ovate; tip acute to slightly acuminate; four pairs. 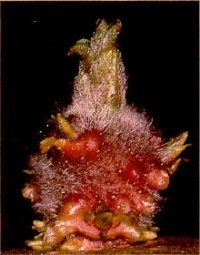 Secondary leaflets: broadly ovate, varying from two on the lower leaves to six or eight on the upper leaves. 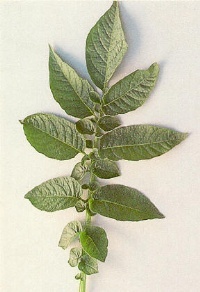 Tertiary leaflets: small, varying from none on the lower leaves to twenty on the mid and upper leaves. 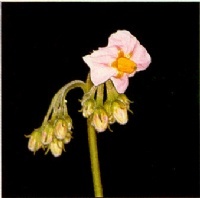 light violet; star yellow-green at the base becoming light violet towards the edges; buds light green to purplish green. REMARK: often sold under its variety name. 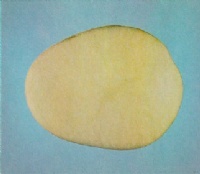 very good for boiling, baking, and french frying; unsuitable for chipping; retains its yellow flesh color when cooked. fresh market and seed export potential. common scab, PVY, air pollution.